Ordination of Karl Glander | Amigos en Cristo By Rev. 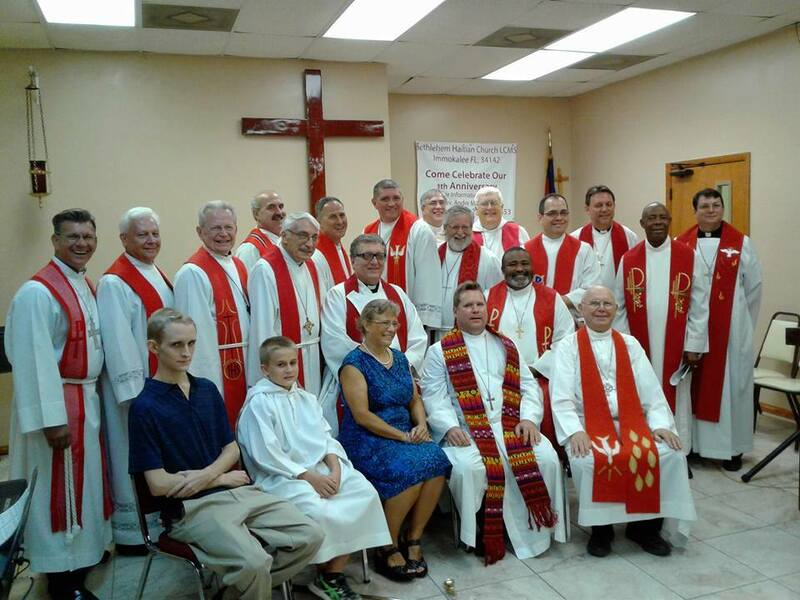 Robert Selle Immokalee, FL - Over a hundred people gathered at the Immokalee Amigos Center to participate in the ordination and installation of Karl Glander on October 16, 2016. Accompanied by his wife, Ginny, their sons Jeff and Matt, and local LCMS clergy, Rev. Glander made his solemn vow that with the help of God he will perform the duties of the pastoral office in conformity with Holy Scripture and the Lutheran Confessions. Rev. Jon Zehnder, Second Vice-President of the LCMS Florida-Georgia District, vested Karl with a red stole, symbol of the pastoral office. Rev. Richard Browning, Circuit Visitor performed the rite of installation. Rev. Glander now joins our team of pastors working in Immokalee: Pastors Andre Mezilus and Saint Luc Charelus serve Bethlehem Haitian Church, while Pastor Bob Selle serves as missionary pastor for our Hispanic congregation. Pastor Glander is called to serve with special emphasis on the English speaking family members of the predominantly immigrant community of Immokalee. By Rev. 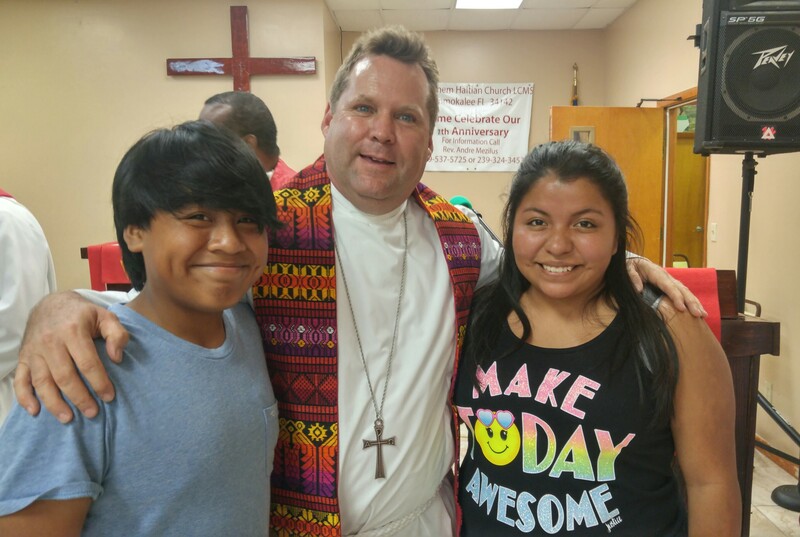 Robert Selle Immokalee, FL - Over a hundred people gathered at the Immokalee Amigos Center to participate in the ordination and installation of Karl Glander on October 16, 2016. Accompanied by his wife, Ginny, their sons Jeff and Matt, and local LCMS clergy, Rev. Glander made his solemn vow that with the help of God he will perform the duties of the pastoral office in conformity with Holy Scripture and the Lutheran Confessions. Rev. Jon Zehnder, Second Vice-President of the LCMS Florida-Georgia District, vested Karl with a red stole, symbol of the pastoral office. Rev. Richard Browning, Circuit Visitor performed the rite of installation. Rev. Glander now joins our team of pastors working in Immokalee: Pastors Andre Mezilus and Saint Luc Charelus serve Bethlehem Haitian Church, while Pastor Bob Selle serves as missionary pastor for our Hispanic congregation. Pastor Glander is called to serve with special emphasis on the English speaking family members of the predominantly immigrant community of Immokalee.